The Maryland Half Marathon & 5K, presented by St. John Properties to benefit the University of Maryland Marlene and Stewart Greenebaum Cancer Center, today announced that Governor Larry Hogan and the First Lady are serving as honorary team captains for this year’s race. The race will be held on Saturday, May 14, 2016 in the Maple Lawn community of Howard County. The #HOGANSTRONG team encourages all Marylanders to join in the fight to outrun cancer. The governor, who was diagnosed with non-Hodgkin lymphoma in June 2015, is now in remission. The #HOGANSTRONG team has created a fundraising page at www.mdhalfmarathon.com and is asking Marylanders to join in this important fight against cancer. Individuals can join the #HOGANSTRONG team by registering to run with a purpose in the Half Marathon or 5K, becoming a virtual runner and fundraising, or making a donation to the team page. “In June 2015, I was diagnosed with non-Hodgkin lymphoma. After months of chemotherapy, countless visits to the hospital, and constant prayer I was blessed to be declared 100% cancer free in November 2015,” said Governor Hogan. 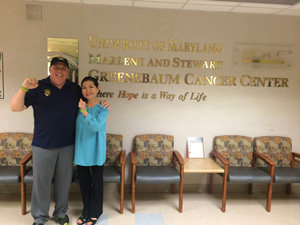 “I couldn’t have fought this critical battle without the daily support of my friends, family, and Marylanders from across the state and of course the excellent care of the cancer experts at University of Maryland Marlene and Stewart Greenebaum Cancer Center. The 2016 event will feature a Kids Fun Run and a Kids Zone, as well as music and a post-race festival. The half marathon starts at 8 a.m., the 5K begins at 8:30 a.m., and the kids’ race at 8:45 a.m. Registration for the half marathon is $75 until race day and $90 on race day. Registration for the 5K is $40. Registration for the Kids Fun Run is $20, and the Kids Zone is free. The University of Maryland Marlene and Stewart Greenebaum Cancer Center, a National Cancer Institute-designated cancer center, is ranked in the nation’s top 50 cancer centers in the nation by U.S. News & World Report. The cancer center offers a multidisciplinary approach to treating all types of cancer and has an active cancer research program. For information about how to join the #HOGANSTRONG team, visit the #HOGANSTRONG team page at www.ummsfoundation.org/HOGANSTRONG. For more information about the Maryland Half Marathon & 5K, visit www.mdhalfmarathon.com. To learn more about the Greenebaum Cancer Center, go to www.umgcc.org.